the College of Vocational Studies of the University of Delhi. Fellow of the Onassis Foundation in Greece on revival of ancient Greek theatre. “India- A Culture Decline Or Revival?” published in 2008.
healthy expression of eroticism are thus, vital for the overall well-being of the society. perversion and recklessness in the name of freedom and liberty. meaningful approach to the subject. researchers, anybody who has an interest in the subject can register. An appreciation of Indian culture and Indian Knowledge traditions. 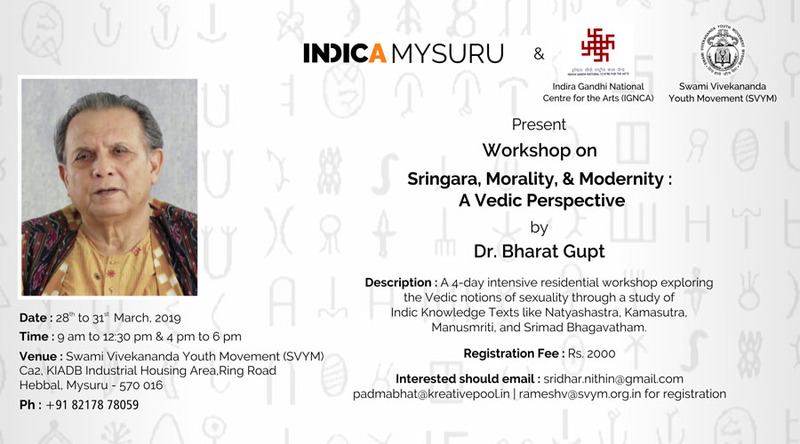 Organizing organizations: INDICA Mysuru in collaboration with Indira Gandhi National Centre for the Arts (IGNCA), New Delhi, and Swami Vivekananda Youth Movement (SVYM), Mysuru.